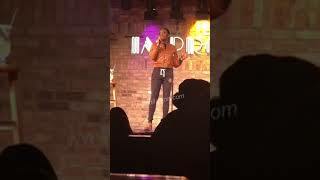 Jessica “Jess Hilarious” Moore is a 25-year-old comedian and mother of one, who started off her comedy in skits. She surely captured the attention of thousands on social media within weeks with her witty humor. Shortly after, she introduced herself to the stage where she began her craft in stand-up comedy. Since then, Jess has been storming the stage with her funny and keeping her fans and supporters entertained with her big personality and unique creativity. Her success has grown rapidly as she opened for the legendary comedian/actor Martin Lawrence in her own hometown, Baltimore city at the Royal Farms arena. Shortly after, just opened for Mike Epps at the very same arena. Jess has also worked with other big names such as Bruce Bruce, Anthony “AJ” Johnson, Rickey Smiley and Reginald Ballard. Jess has featured on some of the nation’s biggest networks such as BET, VH1, TMZ and Centric. Jess filmed season 9 of Nick Cannon’s Wild’N’Out which aired on June 8, 2017. Till this day, she is still excepting offers and sooner than later expecting to be seen on the big screen.